February 5, 2016 by Dr. Randi Fredricks, Ph.D. In one of the best dramatic films of the year, the story expands on real events surrounding the downing of a CIA spy plane over Russia in 1960. 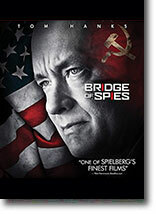 The film begins in 1957 when a suspected Russian agent, Rudolf Abel (wonderfully portrayed by Mark Rylance) is captured by the FBI. The grandfatherly-like Abel, doesn’t deny his activities, but never discloses any information to the Americans. As he goes to trial for a crime that could include the death penalty, the judge appoints a well-known law firm to represent Abel. The head of the firm, Thomas Watters, Jr. (Alan Alda) appoints James Donovan (Tom Hanks) to handle the case. Donovan is a bit surprised because, he practices insurance law and hasn’t worked on criminal cases in years. As Donovan learns later, Watters and Judge Byers (Dakin Matthews) expect a competent defense to show how the American justice system works, but clearly minds have been made up. About all that is left is when the death penalty will be carried out. Donovan discovers that a search warrant was never issued for evidence used in the case. But the judge rejects Donovan’s plea. When Donovan appeals, both he and his family come under fire, both figuratively and literally. While his appeal to the Supreme Court narrowly fails, Donovan is able to convince Byers to sentence Able to a long prison term rather than execution. His compelling argument is that there are spies on both sides and Able may come in handy in the future if one of our guys is caught. And sure enough, the prescient Donovan is correct. Shortly afterwards, Francis Gary Powers and his U2 plane is shot down over Russia. Character to watch: Tom Hanks as James Donovan.